In a perfect gift for new and expectant parents (and siblings), a gentle story pays tribute to the wonder and emotion of a family’s first quiet days with a newborn. Inside the cozy house, a baby has arrived! The world is eager to meet the newcomer, but there will be time enough for that later. Right now, the family is on its babymoon: cocooning, connecting, learning, and muddling through each new concern. While the term “babymoon” is often used to refer to a parents’ getaway before the birth of a child, it was originally coined by midwives to describe days like these: at home with a newborn, with the world held at bay and the wonder of a new family constellation unfolding. Paired with warm and winsome illustrations by Juana Martinez-Neal, Hayley Barrett’s lyrical ode to these tender first days will resonate with new families everywhere. Hayley Barrett says that fond memories of her own days spent nesting and cocooning with her husband and each of their newborns inspired her to write Babymoon. She lives in eastern Massachusetts. Juana Martinez-Neal is the author-illustrator of the Caldecott Honor Book Alma and How She Got Her Name and the Pura Belpré Award–winning illustrator of La Princesa and the Pea and of La Madre Goose: Nursery Rhymes for Los Niños, both by Susan Middleton Elya. Juana Martinez-Neal was born in Lima, Peru, and now lives in Arizona. Barrett’s lyrical poetry is enchanting, and Martinez-Neal’s (Alma and How She Got Her Name, 2018) artwork is as soft and round and delicate as a newborn. Her representation of each precious moment is a croon-worthy, dimpled, tiny-fisted pleasure, and a close-up illustration of the yawning baby captures the book’s tone so beautifully it’s worthy of framing. A guaranteed homerun read-aloud to share at baby storytime, this book is also a perfect gift for expecting friends and an ideal addition for home and public libraries. Martinez-Neal's distinctive illustrations feature soft, hazy lines that convey a dreamlike quality. The muted colors of the clothing and surroundings, along with the ample use of white space, let the family's skin tones shine with a reddish glow that can be interpreted as a blush of happiness. More an encouragement to new parents to savor the moment than a book for babies, this heartfelt offering successfully captures the feelings one wants to remember about this precious time (and leaves out the not-so-pleasant moments). 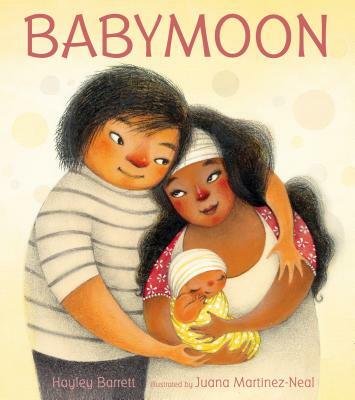 Expect this lovely gift for new parents to live by the rocking chair, helping families discover their own "babymoons." During their “babymoon,” two new parents learn the rhythms of caring for their newborn. The moments shared between the family members are tender, joyful, and sometimes anxious...A graceful celebration of the uncertainty and delight of new parenthood. Arresting yet cozy illustrations and a spare, poetic text work together in this lovely book that will work well as a baby read-aloud, even if its content may speak more to the parent than the child...the flowing language will work well to soothe both baby and parent. A great gift for new parents, this would make a lovely addition to any library’s baby storytime shelves.